Fomed in 1968, they initially started with a repertoire of folk, soul and R&B. However it took a couple of years for the band to gel with Colton, Gavin, Lee and Smith playing in Poet And The One Man Band around the same time. 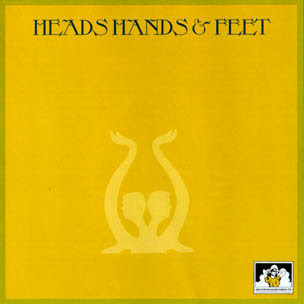 Upon the later's demise, they joined forces with Hodges and O'Neill to form Heads, Hands and Feet in 1970. Their debut album was issued as a double set in the US but as a single album here. It comprised a sort of country-influenced music which met with some critical acclaim. The follow-up, Tracks, made after Mike O'Neil had left, veered more towards rock than country but the group was by now plagued with interpersonal conflict and disintegrated before their final album was released. Albert Lee later formed The Albert Lee Band, which included Gavin and Hodges. Hodges, incidentally, became half of the Chas and Dave duo and Albert Lee later played with Eric Clapton. Thanks for your time and trouble in posting this and the Little Eva to another host, oe. I bought the US double LP edition of Heads, Hands And Feet when it came out, and saw them when they came to my home town on tour.